Tamar Bar is a graphic designer and tattoo artist from Israel that spent the last 3,5 years documenting the life of creatives in Jerusalem and them creating their own culture and scene within the city. In a city like Jerusalem everyday life can be very difficult for artists and creatives and a real underground subculture seems harder to find compared to other cities like Berlin, Paris and London. In her book Tamar reveals the lives of a small group of people living and creating in Jerusalem, a group that lives an extreme lifestyle, made even more extreme by the contrast to the city they are living in. After my good friend Shay Arieli introduced me to Tamar's work as a tattoo artist and told me about her big project about Jerusalem's subculture, I knew I had to talk to Tamar to find out more about her book and Jerusalem. I tend to keep repeating myself, but again I am more than happy to introduce you to another creative mastermind from another interesting town to answer some questions for Biancissimo! Hey Tamar, can you please tell Biancissimo something about you and what you did over the last couple of years? Hi Bianco, I was born in Jerusalem but I grew up in Haifa and I kept moving cities every couple of years so I won’t get bored. When I was 23 I moved to Berlin and stayed there for 3 years, it was great. Then I moved back to Jerusalem, my place of birth and the capital city of Israel, to study visual communication at Bezalel academy of art and design. I immediately developed a very strong and very ambivalent relation to Jerusalem and this complex relationship evolve into my final project- photography book named (surprise surprise) Jerusalem, documenting the underground scene which was my personal getaway from all the difficulties of living in this crazy city. Your book is portraying the underground scene in Jerusalem, so what exactly is this scene about and can you compare it to other cities you have been before? The people I follow in the book are mostly tattoo artists and musicians, they are all very talented so some of them are doing other things like street art, painting, photography (I used some photos of other photographers in the book as well). The tattoo artists work at home or at the diy studio straus, which is a place some of the guys founded together a few years ago, dedicated to tattooing, rehearsals, recording and performances, it's a true and quite literally underground studio. The style of tattooing is very unique and I think it's thanks to the isolation from the world and also the will to make something special, unlike anything else you see in the conservative streets of Jerusalem. The music is very extreme as well, brutal, distractive and harsh, it strives to resist. I think what makes differs it from any other city I’ve been to is that in Jerusalem almost all the culture is subculture. In our first conversation you told me about the thirst of young creatives in Jerusalem to create their own culture. What exactly makes it so hard for creatives there and how did they find a way to express themselves in these harsh surroundings? Jerusalem is full of conflicts, conflicts between arabs and jews, between religious and nonreligious jews, between left wing and right. All of these get to extreme in city which is holy for so many different people, some of them may not even be religious. The leaders are instigating us against one another, they want to maintain those conflicts, to keep political security in the head of the public agenda and so culture always left behind. There are relatively many art schools in Jerusalem but barely one art gallery, design studio, concert venue and very few bars, clubs and hang out places. As a result, most art students move to Tel Aviv right after they graduate. Most of the creatives in the scene I follow are young people who were born in Jerusalem and lived there all their lives, they chose not to give up on it and create their own places for creation. Can you please tell us more about the different creatives that are pictured in your book? How did you find them and what are their creative crimes? My love story with Jerusalem began as I started working at Uganda, a bar which was founded in 2005 as a small record store by Itamar Weiner and Uri Crystal. With time the place got a little bigger, they got a coffee machine, then started serving alcohol and got an extra room for gigs. I immediately knew I found a very special place. Working at Uganda I got to listen to many local bands I didn't know before while they played there, I later on got to know some of the musicians personally and some of them became my friends, as well as other artists who came there to hang. One of the guys for example who was working at Uganda when i got there, is a very talented tattoo artist, I got most of my tattoos from him, one day he told me he found a space with some friends and that they are going to rent it out for cheap, use it as a tattoo studio and a small venue. That was the beginning of studio straus. If I thought Uganda was underground, with its noise concerts and black metal records playing at Saturday noon while people peacefully eat hummus, things now got to a whole new level. Straus, even after its renovation, looks like an abandoned basement with no windows. It gets so hot in the summer nights during music shows that you can hardly breath, and it is probably one of the best places I got to hang out at. So what are the different aspects of your books? Is it pictures, text or a wild ride into everything? 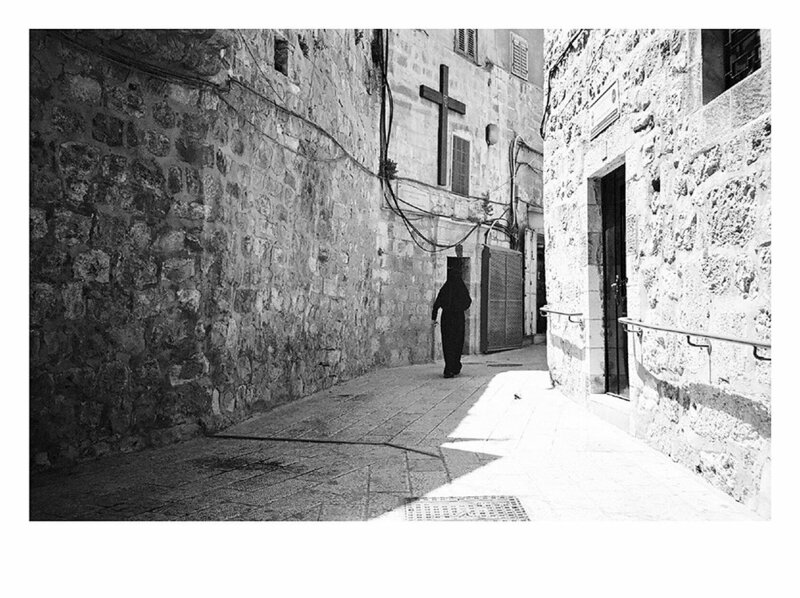 When I started working on the book I already had the few hundreds of photos I took with my film camera during my time in Jerusalem. I first thought it should take the straight form of introducing the creatives, as an id card for each of them, so I started interviewing and collecting all sorts of information, it wasn't for nothing because having the texts in front of me helped me clear my head and understand my project more and more, but at some point, after I had more or less all the ingredients of the book, I’ve decided to leave the text out, abandon all narrative and hierarchies and just let the photos speak for themselves. Tamar, I recently saw some of your tattoo work in Berlin and I really want to know more about this, too. When did you start tattooing and when did you find your own style? I wasn't always into tattoos, I used to think tattoos was only those old school designs, fully in color and shadings, and I never liked it. It was only when I saw Liam Sparkes’ works that I was really blown away. It was about 6 years ago and the first time I was exposed to this kind of tattooing- only black bold lines. I immediately realized this is what I want to do in my life when it occurred to me that tattoos can be whatever you want them to be. It doesn't have to have a certain style and it doesn't have to be fine and technical, the same way good art doesn’t have to look pretty. I still don't feel like I found my own style of tattooing, I keep experimenting and stealing from other artists and looking for my own interpretation for it, and I think it is fine, some artists have really distinguished style and I think it’s fine too. There are no rules as long as you are having fun. How does the tattoo scene in Jerusalem differ to the one in Berlin for example? Does society tend to not respect this kind of art as well? One of the reasons it took me so long to find out that I actually love tattoos is that I have lived in Israel up until that point. The first time I saw tattoos that I found interesting was in Berlin and the tattoo artist was from London. Tattoo scene in Israel is sadly still in its infancy and Jerusalem is no different if not even worse because it is so conservative. When I started tattooing, about 5 years ago, I didn’t even know home tattooing was a thing, I didn’t know there were other crazy people like me doing it outside of the traditional studio. When I got to Jerusalem I met tattoo artists who were working like me, and had the same feeling that they were doing something completely new. Compared to the creative desert people have to live with in Jerusalem, Berlin seems like a way more open and better space for artists. What could Berlin creatives learn from the creative struggle in Jerusalem or better said, should some of the Berlin people be more aware of the prosper situation they are in here? It’s an interesting way to look at it because I would never think anyone would consciously decide to live and create in a culturally undeveloped place such as Jerusalem. Naturally many creatives at some point of their lives would want to move to Berlin, New York, Paris, London, Tokyo or any other city which can inspire them, artistically educate them, offer exhibiting or performing options and last but not least, give an opportunity to earn a decent living. The way I see it, those benefits of Berlin are a blessing and a curse, I don’t necessarily believe in the myth of the tortured artist, but I also think it is very hard to get inspired where there are so many other creatives around you, it’s very hard to listen to your unique inner voice because Berlin is overflowed with artists, art galleries, design, fashion etc. Another thing that for me Berlin was lacking is sense of community because how big it is and the sense of importance in creating because there are so many others. I guess nothing is perfect and the secret is finding the balance, travel as often as possible to get new ideas, to see different colors, new people I think it’s a good advice for everyone not only for artists and you don't necessarily have to travel far. So what’s next Tamar? Where can we see more of your work and when and where do we get a chance to get a tattoo by you? At the moment I am still looking for a publisher for my book, One of the goals I had when I started working on it, is to get a spotlight on the scene and I would love to see it in bookstores around the world. Tattooing is my main focus right now, I’m trying to tattoo or draw something every day and in the rest of my time I’m looking into opening a small tattoo studio in Tel Aviv but this is still a secret.. I’m hoping to do a euro trip sometime in the next few months with my tattoo machine and Berlin will definitely be included. Thank you a lot for your time and work!